Personalized Our Love Grows Acrylic Block Keepsake is the best way to display your love all year long. This keepsake will be personalized with any 2 custom message lines to make it a unique gift for your loved one. Makes a great gift for Anniversary, Sweetest Day or Valentines Day! 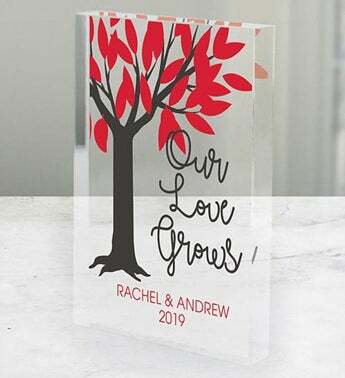 Acrylic Paperweight Keepsake stands 4" x 6" x 1/2" thick.